Recently, a Canadian mother saved her young son from a cougar that attacked him in her family’s backyard. 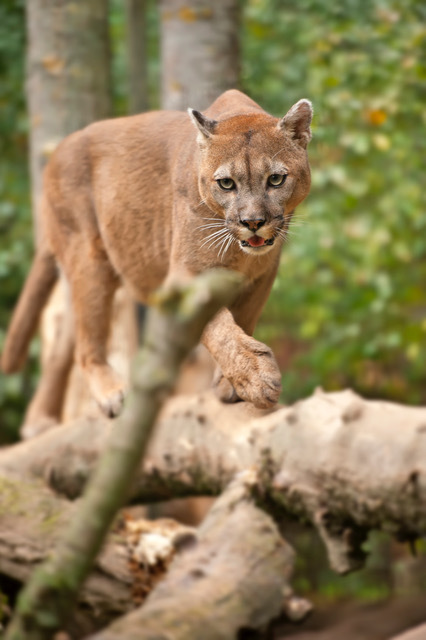 She pried open the cougar’s jaws with her bare hands as he tried to drag the boy away. A few years ago I read a news story about another British Columbia woman who saved her son from a cougar using a kitchen towel. These two mothers courageously risked their own lives to protect their boys. If you google the phrase “mom saves child from cougar,” you’ll find stories of other heroic mamas. One mother used a camping cooler, and another a water bottle to rescue their children from an attacking cougar. One brave mom managed to save her child but died from her own injuries. Faced with a dangerous attack on a beloved child, would any mother simply stand and watch? No, a mother’s love compels her to protect and defend her children, and to fight to the death if necessary. “although I was very eager to write to you about our common salvation, I found it necessary to write appealing to you to contend for the faith that was once for all delivered to the saints. For certain people have crept in unnoticed who long ago were designated for this condemnation, ungodly people, who pervert the grace of our God into sensuality and deny our only Master and Lord, Jesus Christ” (Jude 3-4 ESV). The believers in this church (the true ones, that is) knew enough about the doctrine of the apostles—the teachings that were probably already set down in a not-yet-completed New Testament canon—that Jude didn’t need to flesh out the “the faith once for all handed down.” These early Christians were already united around the body of doctrine that was the faith, so Jude could jump straight into his appeal for them to defend it. The sneaky false teachers were attacking this church from within, and Jude’s letter is a plea for every single true believer there, everyone “called, beloved in God the Father and kept for Jesus Christ” (Jude 1), to rise up and defend the apostles’ gospel. And because Jude’s letter is scripture, it is, by extension, a plea for every true believer down through the ages and across the world to be ready to protect and defend the gospel. The call to defend the faith is not just for pastors and deacons, but for laymen and laywomen, too. God calls us all to be defensive warriors, fighting against imposters within the church who destroy others by distorting the truth. Like the brave mothers who snatched their children from the cougar’s jaws, a believer’s fight to defend the faith is compelled by love. We fight, first, because we love the truth, and second, because we love people and want to save them from certain death. We fight to “save others by snatching them out of the fire” of God’s judgment against unbelief and apostasy. We defend the truth as an act of mercy toward “those who doubt” (Jude 22-23). But we can’t contend for the faith if we don’t know what it is. We won’t recognize infiltrating false teachers if we don’t know what the apostles taught. We can’t discern a destructive false gospel if we don’t understand what the real gospel is. Step one for contenders, then, is to know the truth. Jude’s first readers (or hearers) had a partial canon of scripture, yet he assumed they understood what the faith once for all delivered to the saints was. We have a complete canon, and our own personal copies of scripture, so we don’t have an excuse for not knowing the whole body of doctrine handed down to us from the apostles. If we don’t know it, we can learn it as we study the Bible, and as we read or listen to faithful Bible teachers. Step two is to step up and defend the faith we know. Although there may be cases in which false teachers need to be physically removed from the body, fighting for the faith is mostly a war of words. We fight for the faith by speaking—or like Jude, by writing. And while we may sometimes be forced to use strong language as a weapon against wolves in our midst, most of our contending won’t look like a war, not even a word war. No, our most common defense tactics will be teaching and reminding. We contend for the faith when we teach the truth to those among us who don’t have a firm grasp of it. Our hope is that as they learn, they become more grounded in the faith and less likely to be snatched away by false teachers with a false gospel. And for those who are already established in the faith? As we remind each other of the beauty of the truth we already know, we encourage faithfulness to it (2 Peter 12-13). We fight for the faith by helping each other remember how lovely our gospel is, because those who are busy basking in the glory of the real gospel aren’t fooled by a false one. This blog is an edited version of a piece first posted by Rebecca at Out of the Ordinary.